Join me for this 21-day online class where I will show you how to create an art journal (or other book of your choice) loaded with your own personal and unique marks. Each day, for 21 days, you will receive a new mark-making prompt designed to spark your creative juices and expand your options for putting your individual voice into your artwork. In addition, there will be 3 short weekly PDF lessons that will include videos demonstrating different approaches to using your art materials as well as options for taking your work to a larger scale. You will also have the chance to be inspired by and learn from the other artists as each day’s prompt is completed and shared within our private classroom. You can keep it simple by working with supplies as basic as a notebook and pen, or bring all your favorite paints and goodies to the table. Whatever materials you choose, this will be an opportunity to discover the marks that make your heart sing and have fun connecting these marks to what you want to express. Whether you feel stuck in a creative rut and are looking for new options to play with, or you are wanting to develop a more individual artistic voice, this class will help you to expand your mark making vocabulary and add visual interest and dimension to your creative expression. The course includes 21 daily mark-making prompts designed to help you expand your repertoire of unique marks. There will be a live Q&A session through Facebook Live, 3 groups of downloadable video content, a 3-part instructional PDF delivered via email, and a private Facebook classroom to engage and ask questions. YOU CAN JUMP ON MY EMAIL LIST TO BE FIRST TO HEAR ABOUT WHAT’S NEXT! Join me for a short summer session as we uncover the threads that connect us with our unique creative point of view. This three-week online course is a little lighter than our usual intensive six-week courses. Think ice-cold watermelon and sangria on the porch, and daydreaming about the things that make your heart say "yes!". In this class, we will be working with an art journal (or any other type of notebook) and some basic art supplies. These books will not be your mama’s art journal! Rather than working towards a beautiful, 'finished' art page, we will be using these materials to help connect us to our own creative voice. Your materials can be as simple as a notebook, some magazines or old papers, a glue stick and your favorite writing tool. Or you can bring the whole enchilada of your art supply collection to the table. Either way, this class is the beginning of what I hope will be a life-long relationship between you and your books! Working with this process is one potent way that I create alchemical containers for my own work as an artist. Now I want to share with you some simple steps you can take to begin discovering your own unique point of view and intentions as an artist or creative spirit. The course includes a weekly live lesson through Facebook Live, 3 groups of downloadable video content, a 3-part instructional Ebook delivered via email, and a private Facebook classroom to engage and ask questions. You can email me at hello@shaunameiri.com if you have any questions prior to registering! Want to know when the next class is starting? Jump on my email newsletter list! For four days we are going to dive into the practice and process of non-objective abstract painting. Ardith and I will work with each artist to help them understand how to create from a point of view and intention, identify which marks are uniquely theirs, and work with the visual expression of emotion and inspiration. Through the process of using mixed media acrylics we will also explore the layering process and discover how it relates to the visual representation of your personal point of view. Expression Live will be an experience that helps each artist identify, alter, and render a painting in their unique way, with a connection to dynamic and expressive techniques. We will model how to create abstract paintings using the fundamentals of art: line, color, composition, texture and contrast. If you are one of those artists who has longed to figure out a way to paint with deep connection to your own voice with a personalized approach, then this is the workshop for you! All supplies will be included (with a set number of canvases). In addition, we are including a ticket to attend the Mobile Arts Council Throwdown Event where Ardith will be defending her throne and I will be there acting as her right-hand woman helping to save the crown!! Here's a little feedback from some of the artists who have studied with us in person! For 6 weeks we will dive into the practice and process of non-representational abstraction using acrylics and mixed media. This course is design to help the artist understand how to create from a place of point of view and intention, identify which marks are uniquely theirs, and work with the visual expression of emotion. We will show you how to design abstract paintings using some of the fundamental elements of art: line, color, composition, as well as value and contrast. You can work on paper or canvas, utilize both traditional and non-traditional tools and products, and learn specifically how to incorporate hand made tools into the creative process. This course will be co-taught by myself and Ardith Goodwin, an abstract and figurative painter who specializes in fracturing and bold use of color. The course includes live lessons through Facebook Live, 6 groups of downloadable video content, an instructional Ebook, a private FB classroom to engage and ask questions, and critique and feedback. In addition, optional one on one instruction can be accessed through a consultation. Here's a little feedback from some of the artists who have studied with us! "I loved the outstanding, safe environment"
"Ardith and Shauna were both excellent at meeting each artist where they were and giving the right nudges to push each person where they needed to be"
"RICH, RICH, RICH in content, instruction, attention and feedback"
Message me at hello@shaunameiri.com if you have questions prior to registering! THIS COURSE IS SOLD OUT! SIGN UP FOR MY NEWSLETTER TO BE FIRST TO KNOW ABOUT THE NEXT ONE! Have you been eager to lean in and explore the world of expressive figurative painting in acrylic but unsure about where to begin? 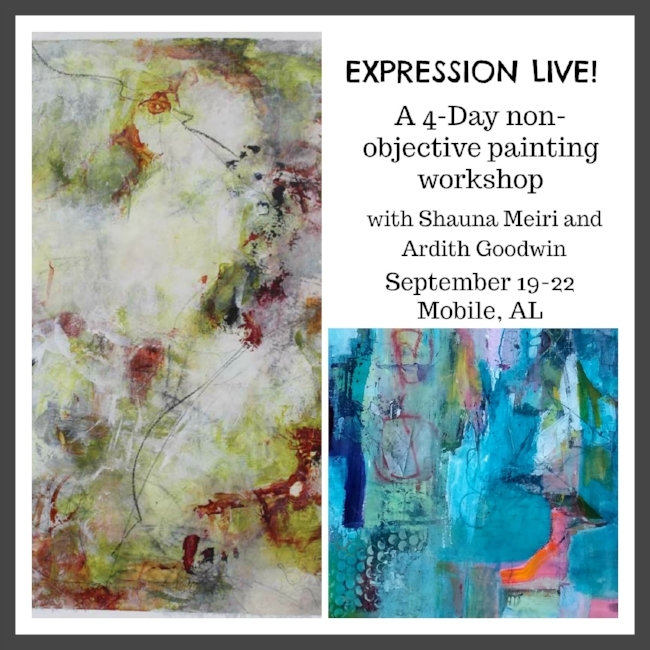 Ardith Goodwin and Shauna Meiri, two acrylic painters with a gift for fracturing and deconstruction, are joining forces to co-teach a 4-day workshop April 7-10, 2017, in beautiful Fairhope, AL, at the Eastern Shore Art Center. Ardith specializes in the fractured line and approach, building figures through structure, variety of marks, and the transparent use of color and contrast. Those of you who follow me know that I work with layers, texture and contrast along with cycles of deconstruction and rebuilding to create artwork that connects with the mystery beyond the visible world. Although we each have unique styles as we approach the canvas, we share the belief that the soul of the artist combined with the spirit of the figure can be embraced and captured through freedom of play, mastery of craft, and an openness to create from a place of authenticity. Learning the basics of the human form and structure of the face, and how to manipulate each through the use of expressive line, marks and color. Working with quick sketches and loose studies, playing with a variety of materials and having fun creating artwork that has more impact and expresses what is important to you. Exploring the building up of layers through the use of mixed media to create visual interest. Experimenting with using deconstruction as a way to create textures, shaking loose from perfectionism and making room for the unexpected. Practicing the integration of new techniques and ideas into your current creative work. It is our intention to give intensive individual attention to each student and their artistic/creative process. We will offer an immersive, welcoming class filled with practical knowledge as well as nuggets of wisdom that both of us have learned through our years (and love) of creating figures and faces. This is a one day workshop at Lake Burien Physical Therapy in their beautiful new studio space. In this one day class I will show you how to use a variety of materials and techniques to begin creating lively and expressive faces. This workshop will not be a traditional “how to paint a face” class. Instead we will focus on learning different ways to convey emotion and feeling. You will also learn how to integrate these new skills into your own style of creating art journal pages and/or paintings. I am happy to announce that I will be part of the spring edition of 21 Secrets this year! You can read all the details about my class here.